Most of you know that angle grinder is not only used for polishing, sharpening, and grinding surfaces, but also for cutting surfaces. Tiles can range from stone,porcelain, glass or ceramic tiles. Different surfaces come with different angle grinders to use. In addition, different techniques are used depending on the shapes you would like for your tile. This can be circular, semi-circular or rectangular. Most of the time you would use an angle grinder and a diamond blade to cut tiles. However, the most effective way to cut tile is with a tile wet saw. This requires special techniques and tools that may not be for everyone. A diamond blade has diamond grit embedded in the steel rim to grind away hard materials. In this article, we shall look into the things you should consider before cutting as well as offer a step-by-step process on how to cut tiles using an angle grinder. A diamond-tipped, smooth-edge blade is the best type of blade to use with an angle grinder, especially when cutting ceramic tiles. This is because it leaves a beautiful smooth cut. On the other hand, notched blades are best for porcelain tiles while serrated blades are more suited to natural stone tiles.When you get the right blade for the right tile, ensure it is attached securely to the grinder. This can be done by using the accompanying tightening tools for the grinder you have. Make sure you tighten the blade because vibration leads to cracked ceramic tiles. The grinder movement can chip off the ceramic glazing when cutting the tiles. This is why it is essential to use masking tape to cover the edge as it offers great protection to the ceramic tile. Depending on your comfort level, you can either use a single layer of the tape or more. When using it, first draw your marker lines, place the masking tape on top and then trace the lines through the top of the tape. You can add additional layers if you would like but be sure not to overdo it. It is dangerous not to have the proper equipment when operating power tools. When cutting with a diamond blade, it creates a lot of dust and noise. You should, therefore, be using a good quality two-strap dust mask for the dust and earplugs for the noise. In addition, you would need work gloves due to the sharp objects and safety glasses for the flying fragments of the tile that chip off during the grinding process. It is also advisable to this process when you are outside where it is well-ventilated. When cutting, hold the grinder firmly with both hands as you cut the pieces of the tile and clamp them to a cutting surface for the best results. If the grinder has a side handle, this is definitely a plus. There are several types of angle grinders. They are electric, cordless, pneumatic and petrol-driven angle grinders. You can choose either of the four depending on the work you intend to do. Electric angle grinders are known to be more powerful and best for large jobs as they cover a lot of surface area. Cordless angle grinders, on the other hand, are more convenient as they can move around freely and the batteries can be easily replaced and charged. Pneumatic angle grinders are less powerful than the electric ones but can be easily maneuvered around. When you buy the angle grinder of your choice, ensure you read all the instructions and guidelines provided, being sure you understand the recommendations given by the manufacturer before using it. As mentioned, different blades depend on the type of tile you would like to cut. Therefore, it is for you to select the right blade depending on what you would like to cut. If you would like a smoother surface, a smooth blade would be best. If you would like your tile to be a little rough around the edges, a serrated blade would be best. This is however mostly used to cut concrete or brick tile. After choosing the right blade for the angle grinder you have, now it is time to begin the cutting process. The first thing you should do is secure your tile with a clamp on the surface you intend to work on. It is preferable to do this outside or in a well-ventilated room due to the dust that forms during cutting. This is also a good time to have on all your safety equipment. 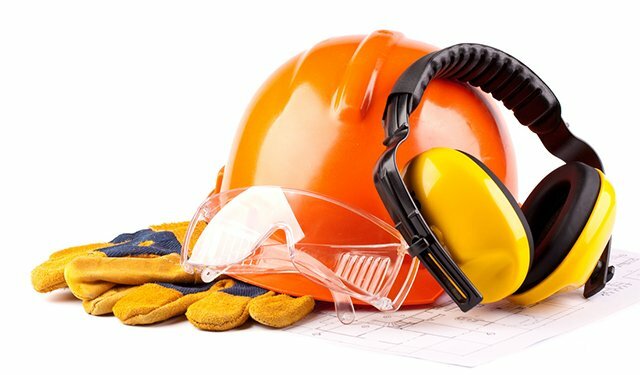 These are safety glasses, work gloves, dust mask and ear plugs for the noise. In this step, you should take the measurements you need for your tile. Thereafter, mark the area where you would like to cut. This can be circular in shape, square or semi-circular. Before marking, it is advisable to use a masking tape. This is because it holds the ceramic tile during the cutting process, thus avoiding chipping off of the tile. After assembling the blade on the angle grinder, securing your tile and marking the shape, it is now time to cut. Using the required speed and pressure, you can now cut the tile depending on the shape you would like. Make sure you cut along the markings. Also, go deeper with each cut until you succeed. After cutting, you can use the flat side of the blade to smoothen out the edges of the tile. You may also need to smoothen out with sandpaper for the best results. After you are done, make sure to return all the equipment safely. It is evident that you can use an angle grinder to cut tiles. A tile wet saw would be preferable, but an angle grinder requires less special techniques to operate it. Therefore do not be shy and go try your hand at using an angle grinder.